Need a fun and easy way to spice up the "kid's table" this year? Check out these adorable Snowman Chair Covers from Disney's Family Fun. All you need is a few yards of felt, a sewing machine and some glue! (Psst... a plain white pillow case works well too!) For even more fun, cut out an assortment of eyes, noses, and mouths and let your littlest guests decorate their own snowman before the feast! Turn your kids into a snowman this year! It's as easy as it sounds... make a snowman without a head, and have your child stand behind it for an adorable photo opportunity. 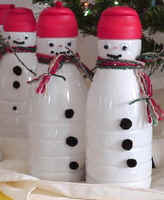 Make a whole family of headless snowmen to create a Christmas photocard that your friends and family won't soon forget! We don't need the commercials to tell us that there is something magical about Rice Krispie Treats! 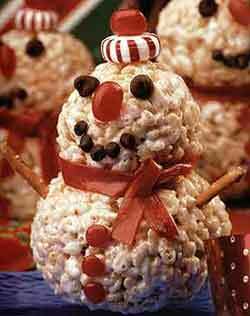 Check out this fun Snowman Treats recipe from The Recipe Link. These are sure to be a crowd pleaser! These adorable little buddies are super easy to make! What an adorable way to recycle your coffee creamer bottles! Check out the full instructions here at DLTK's Growing Together. Pin The Nose on the Snowman! For a fun game for the little ones this holiday season, make a snowman on the wall using various sized paper plates. Give your frosty friend a smile and a mouth, and cut out several carrot shaped noses. Use a little double sided tape and blindfold your guests to see who can get the nose on the snowman! These ideas are so cute. We go through enough creamer to make an entire snowman army :) I really like the snowman chair covers. But since I don't know how to operate (or own) a sewing machine, I would definitely use a pillow case!